The Book Chook: Let’s Celebrate International Book Giving Day 2015! 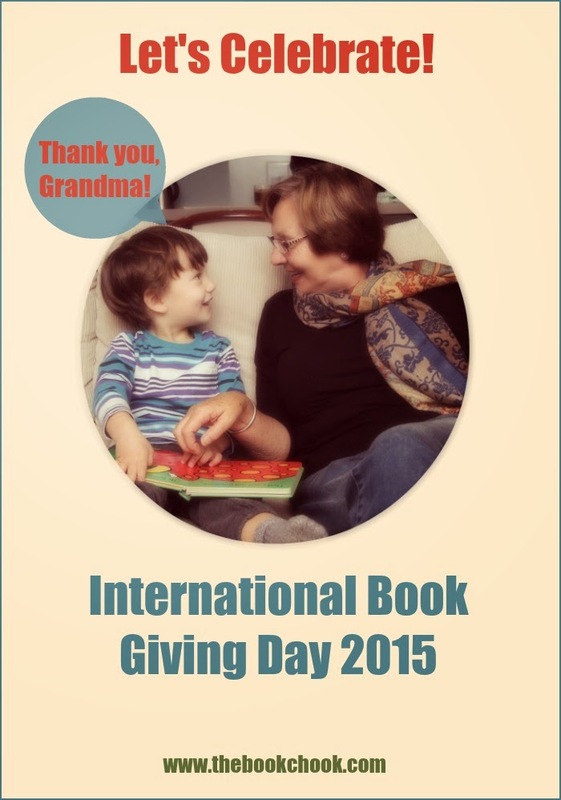 Let’s Celebrate International Book Giving Day 2015! Can you feel the excitement building? It’s almost that time of year again: International Book Giving Day! This is a day dedicated to getting new, used, and borrowed books into the hands of as many children as possible. It takes place on Valentine’s Day, 14 February. What I love about this celebration of books and reading is that it’s so easy to adapt it to fit your family’s life. The idea is to put the focus on giving books, perhaps instead of (or as well as) the more traditional candy. Remember, books don’t cause cavities and will only add pounds if you wear them about your person. Sneak into a waiting room and leave some new or gently used books for another child to read. Choose to give a book gift on Valentine’s Day to someone you care about. Hold a community event like a book swap, fundraiser or used book drive. Donate books or funds to local or global nonprofit organisations. Add IBGD bookplates and posters to the books you give. Find hundreds more ideas on the IBGD website. Have you noticed the cute graphic in my right sidebar? If you click on Give a Book/Swap a Book, it will take you to Playing by the Book where you can sign up for the International Book Swap organised by Zoe. You have until February 1 to join in. This is such a wonderful way to involve your kids in International Book Giving Day! I have a special suggestion for this year. 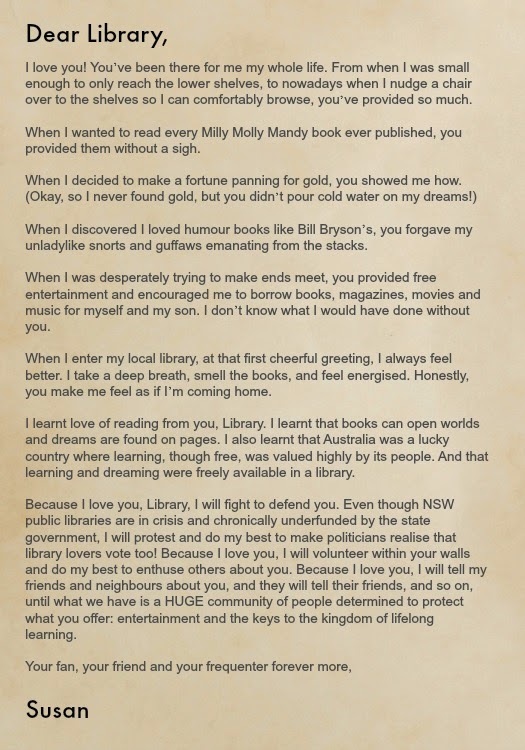 After reading The Guardian newspaper's Love Letters to Libraries, I thought it would be a fine idea to write a love letter to my local library and have it delivered on February 14, along with a promise to donate money for books of the library’s choice. Who better to give books to than the library?! Rather than choose the books myself, I know my local librarians have a needs list and also understand what books work best in our library. Are you interested in joining me? Do you too love your library, and what libraries have meant to you? I hope you'll go ahead and write your own letter to your library, and maybe consider giving a book or two the way I plan to. Valentine's Day and International Book Giving Day - what better day to support our local libraries? Reading: An Excuse to Celebrate! Let’s Celebrate International School Library Month! Let’s Celebrate International Literacy Day! Let’s Celebrate Library Lovers Day! I love your letter, Susan! Thanks! I hope you'll write your own, Marjorie - let's share that library love and the joy of reading!